The Christ of Esquipulas is an Image of Jesus Crucified, that is venerated by millions of Central American faithful. The image is located at the Basilica of Esquipulas in the city of the same name in Guatemala. 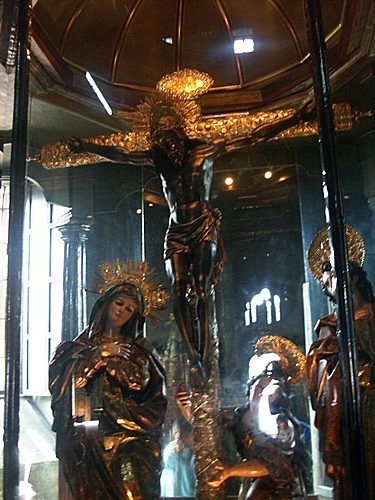 The sculpture of the Christ dates back to 1595 and is made of cedar wood. It inspires one of the most important Catholic pilgrimages, topped only by the Virgin of Guadalupe in Mexico. Quirio Cataño sculpted the dramatic art piece in March 9, 1595. Nine years later, in 1603, it had already performed at least one miracle. In 1736, the Bishop of Guatemala XV and first metropolitan Archbishop Fray Pedro Pardo de Figueroa began the process of the construction of a grand Baroque temple to house the Santo Cristo de Esquipulas. On November 4, 1758, the church was inaugurated, that now shelters the venerated image . The Basilica Esquipulas is the second most important religious site in the Americas, after the Virgin of Guadalupe in Mexico.